How do you use your bits? I like to try to use up all of my bits of favourite fabrics. I made this huge floor cushion…. with the non-scraps and some white Kona cotton. When my 4 year old lays on it, you can see its actual size. For the cushion top, I used the same basic pattern from my Step In Time quilt. I then added a layer of batting and quilted it in a meandering pattern. This will be the part the kids will sit on, so I wanted it to be sturdy. To fill it, I pulled out the poly-fill from 2 old pillows (which were ready to be turfed). 2 pillows – that’s a lot of stuffing. Amelia loves it… and has claimed it as her own. This means I need to make one for Sam, or listen to them arguing over who gets to sit on it. How do you use up your fabric non-scraps? 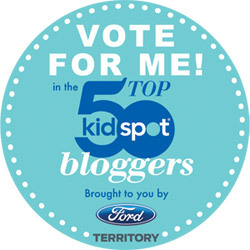 I've made it into the Kidspot Top 50 Bloggers 2012. If you can spare a few minutes please vote for Samelia's Mum and help me get to BlogHer in NYC. I voted for you Anorina! And thanks to you I'm now in the draw to WIN the $5000 voting prize too! I keep vowing to do a scrap quilt, but as I was given a lot of old fabric (and seem to continue to receive it) I have not only my own scraps (which would be of something I once had a crush on) but scraps of things that are other peoples' taste. So I feel like a scrap quilt would be an obligation & never get around to it! Wow I only just realised that Step in time quilt design was yours! I have that mag and now I can't find it argh! I want to check it out, maybe I will de-stash and make a step in time quilt.... I'll keep you posted! I've just voted and am also in the running for a prize! that was a very pleasant surprise right at the end! I love this cushion so have just bought some Momo fabric from you to make it in!! Love it! (have also voted for you - Good luck!) Hope you get to NYC! Gorgeous cushion, no wonder Amelia has claimed it. What a cutie-pie she is. Love the cushion and your cute, cute daughter! I'm collecting 2" squares for a someday quilt, and I also plan to use some of my scraps and non-scraps for doll quilts and charity baby quilts. Wow! Loving the cushion!!! What a great way to use up scraps of fabric too big to cut into multiple 2in squares, but too big for 5in charms!! I can see why Amelia has claimed it!! !